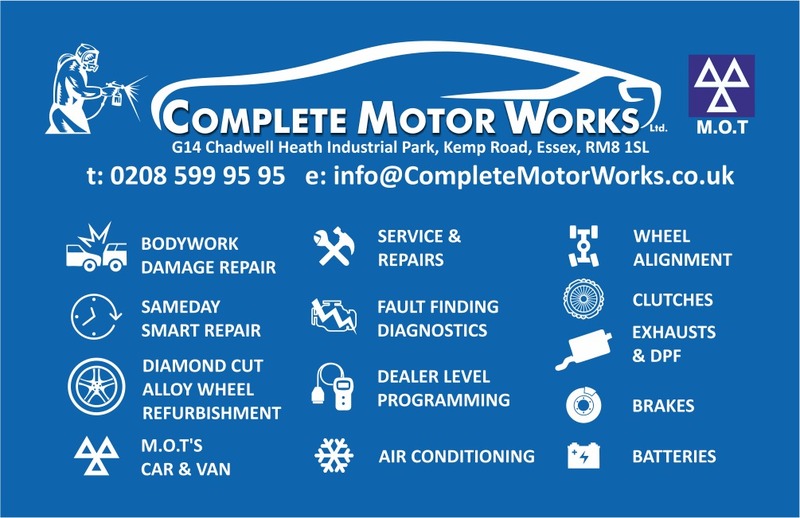 Complete Motor Works is a well established one stop automotive business specialising in all types of body work and all mechanical work. We do it all – including class 4 and 7 MOTs. Using a state of the art work shop equipped with 7 ramps, an in ground scissor lift with Super Tracker Wheel Alignment and 2 spray bake ovens we have a high capacity of work load and can cater to all types of work; Retail or Commercial. We maintain various company car fleets for our commercial customers and offer free local pick up and drop offs. We ensure all our quality of work is carried out to the highest standard and the most important – at very competitive prices. Other facilities include a waiting reception and male and female toilets. Come visit Complete Motor Works for all your automotive needs. For more regular updates check out our Instagram page ! Commercial and Private Fleet care, Collision repair specialists, Smart Repairs or heavy, 7 ramps for all mechanical work and 2 spray bake ovens. We pride our selves with all types of automotive repair and support.